This article discusses the observed trends in particle design and engineering technologies, as well as the main factors and opportunities driving the principal technological advances in the biopharmaceutical industry around this topic. Microparticles govern many solid dosage forms in the pharmaceutical and biotechnology industries. Successful instances of this include different dry powders for inhalation in the form of aerosols for the treatment of respiratory affections, as well as certain microformulations for delivery into the lungs or nose. Capsules and tablets filled and pressed for oral applications and transdermal delivery patches also represent examples of microparticles. Interestingly, the design of novel particles and, particularly, microparticles, a decade ago was mainly related to their use as carriers, usually consisting of micronized dry material. Today, this conception has suffered many changes, and the overall perspective regarding particle design in the biopharmaceutical industry has significantly changed. These technologies are currently seen as novel drug delivery strategies. Particles are no longer seen as passive carriers, but rather as critical elements in the drug delivery system. This phenomenon in part is due to the advancements of therapeutic approaches, which every day require more complex dosage forms to meet the desired behavior of the drug response in the patient. 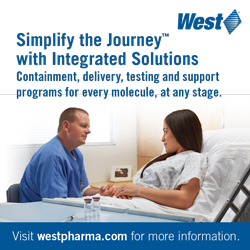 Specifically designed particles are engineered to address a spectrum of functional responses and meet the conventional parameters of active stabilization, drug transport, modulation release, and dose targeting. Under this scope, particle design and engineering constitutes a novel discipline capable of smartly combining different technologies and disciplines, ranging from elemental chemistry and colloid and interface science, to advanced materials and nanotechnology. This novel approach has allowed the industry to face important challenges, such as poor solubility and absorbability, the need for controlled-release applications, improved taste-masking, enhanced targeting, degradation protection, etc., through the development of new pharmaceuticals technology and novel dosage forms. Particle design techniques capable of modifying certain properties to dote them with new functionalities are becoming essential in the growth of the biopharmaceutical industry. This fact gains special attention due to the crucial need for new drugs or reformulations of established molecules to be improved and efficiently delivered. The aforementioned requirements additionally suppose the emergence of novel manufacturing technologies. Conventional methods consisting of the formation of fine particles, including solvent crystallization or precipitation followed by harvesting, drying, and micronization, constitute important tools aimed at achieving different targeted particle sizes. Nevertheless, such methodologies imply multistage processing sequences, so that more efficient technologies are required. Similarly, such methodologies used to involve high-energy inputs related to the damage of crystals, amorphous domains, and lack of physical stability, among other drawbacks directly impacting the product quality, which also requires novel approaches. In addressing this concern, recent years have seen the appearance of supercritical fluid (SCF) methods for engineering drug particles. Through this methodology, well-defined crystallographic, chemical, and physical properties have been observed. We will now look at several methods associated with this technology. The solution-enhanced dispersion by supercritical fluids (SEDSFs) process has demonstrated the broadest acceptation for biopharmaceuticals applications. Generally speaking, the technique consists of the use of the SCF as a dispersing anti-solvent, as well as an extraction medium for the solvent, which derives in the efficient precipitation of the solute. This technique serves equally for both organic and aqueous solutions. Through this methodology, important milestones were achieved, scaling the process to large manufacturing scale and clinical trials procedures under the Current Good Manufacturing Practice (cGMP) regulations enforced by the US Food and Drug Administration (US FDA) and the European Commission (EU). However, the researchers communicate several inquiries about the expectations of this technology. The basic dichotomy is evidenced by taking into consideration that at this scale, some variables cannot be controlled by current practices in particle engineering, processing, and characterization. This observation enters in conflict with the fact that critical sources of variability may be identified using a cGMP approach. On that note, concerted efforts to understand product engineering through a broader conception should take place in order to guarantee a successful regulation and control of product properties and process attributes. This fact gains special importance under certain normative, such as the International Conference on Harmonization (ICH) Q8 (R2) Pharmaceutical Development, published on November 20, 2009. This provides information on how to present knowledge gained when applying scientific approaches and quality risk management for developing and manufacturing a product. Indeed, the ICH privileges the quality at design levels instead of at product level. For that reason, an integrated relationship, or harmonization, as the rule suggests, between different processing operations, product development stages, components, and product quality, etc., results are essential. The following paragraphs focus on providing pharmaceutical and biotech actors with a broader landscape regarding the role of particle design and engineering in the industry from a competitive perspective. FIGURE 1. 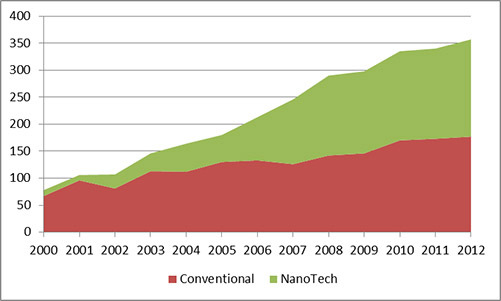 The incremental increase in the number of granted patents from 2000 to 2012 for relatively more conventional techniques consisting of microparticulates and micronizing, and the incremental growth due to the advent of nanotechnologies in the life sciences and biopharma industry. Source: Frost & Sullivan. Particle design engineering methodologies can be derived from the modification of crystal forms to confer them the desired properties, as well as the alteration of the micro/nanometric properties to generate micro/nano particles of interest. On the other hand, particles can be obtained by self-assembly or incorporating biological pieces, as in the case of engineered antibodies (EAs) and virus-like particles (VLPs). In turn, complex hybrid systems conformed by the association of dissimilar approaches have led to remarkable advances in therapeutics. This is the case, for instance, of nanoparticulate drug delivery systems for pulmonary administration of antiasthmatic agent, insulin, and many other medicines. Furthermore, pulmonary p-DNA, siRNA, and nucleic acid as gene delivery systems considered as micro/nano-particles can also be mentioned. Remarkably, this novel discipline requires a smart comprehension of the phenomena governing the mechanisms of action aiming to address, as well as an in-depth understanding of the particle formation or assembly process. Evolution and innovation engines must be crucially concerted to facilitate the emergence of new, cost/time effective, and even personalized, therapeutic approaches. In Figure 1, the trend in the number of patents granted during the period 2000-2012 for particle design and engineering regarding biopharma products and processes can be observed, as well as the impact in the synergy that results from the evolution of nanotech developments focused on the life sciences and biopharma industry. Beyond therapeutics, particles design and engineering has reached a unique niche in life sciences and biotech as services tools. New miniaturized, high throughput technologies for DNA sequencing, flow cytometry, drug discovery, and â€“omics (genomics, proteomics, metabolomics, etc.) and photonics applications are basing part of their work principle in the attachment of functional biological molecules to micro/nano-particles, usually spheres. Thus, for example, principal uses for microspheres in life sciences research applications rely on molecular diagnostics; fluorescence and enzyme immunoassays (FI, EIA); capture reagents for lateral flow devices and diagnostic assays; nucleic acid separation and protein separation; surfaces for immunoprecipitation; fluorescence microscopy; flow/image cytometry; magnetic cell separation; agglutination tests; among many others. As a result, a plethora of small and medium companies, most of them evolving from startups and spin-outs, are currently playing an important role by providing services to bigger pharmaceutical and biotechnology companies worldwide. For instance, ReSyn Biosciences (Pty) Ltd, a start-up enterprise incubated by CSIR Biosciences, a South African bio-tools company, has developed a novel microsphere technology platform, which consists of a loosely linked polyethyleneimine polymer matrix allowing penetrating biological and synthetic molecules throughout the microspheres. According to the researchers, this technology offers exceptional capabilities, especially regarding their high surface area for binding of molecules and increases in the overall performance in several orders of magnitude. Similarly, SiTec PharmaBio, a technologybased company based at Parc Cientific de Barcelona, Spain, offers pharmaceutical and biotechnology companies a variety of services in key areas of R&D, from lead and drug candidate selection to early clinical development based on micro/nanoparticulates. Hovione is a leading international group dedicated to the cGMP development and manufacture of active pharmaceutical ingredients (APIs) through the use of different proprietary, cutting-edge technologies. Hovioneâ€™s particle design technology platform offers real-world solutions enhancing drug delivery and bioavailability challenges by spray drying and congealing, hot melt extrusion, coprecipitation for solid dispersions, emulsification, controlled crystallization and co-crystallization, jet milling, wet polishing, and inclusion complexes generation. On the other hand, Particle Sciences, Inc. became a leading contract research organization (CRO) based on particle design technologies to support analytic, bioanalytic, physical characterization, and manufacturing services for the pharmaceutical industry. Successfully identifying common obstacles in achieving cost-effective drug product important challenges through different technological approaches that include particle design and nanotechnology applications. 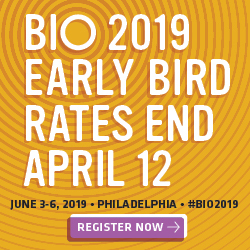 Naturally, top players in the life sciences industry, such as Life Technologies, Sigma- Aldrich, among many others, are also innovating this technology to enhance the performance of their products and offer top solutions in life sciences arenas. However, the appearance of new tech niches with the consequent participation of new companies create a cross-pollination environment in which different actors from diverse sectors can play, significantly enriching the partnering and alliance models and strategic behaviors. FIGURE 2. 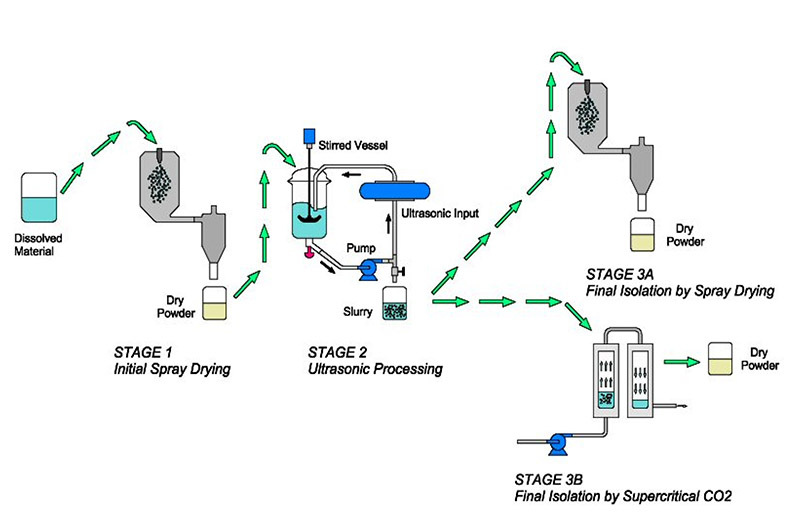 Depiction of the UMAX processing flow of the product via spray drying with cGMP in FDAapproved facilities. Source: Frost & Sullivan. Picture Credit: Prosonix Ltd.
On the other hand, regarding therapeutics approaches and involving medical devices development, Prosonix, an Oxford-based specialty pharma company specializing in respiratory diseases, has patented UMAX ultrasonic particle engineering and technology. In a few words, this innovative approach involves the operation of a complex and highly controlled disposal, coupled with the application of ultrasound in the also proprietary Prosonitron reactor system (PRS). According to the researchers, the UMAX process (Figure 2) achieves these means by optimal particle design, while facilitating the manufacturing of spheroidal and more regular-shaped crystalline particles for both dry powder inhalers (DPIs) and pressurized metered-dose inhalers (pMDls). In this manner, UMAX technology is capable of providing a powerful and potential platform to produce multi-component particles for combination therapy for respiratory disorders. In the researchersâ€™ opinion, such multi-component co-associated particles could provide a synergistic effect at the molecular and cellular level, as in the case of inhaled steroids (ICS) and long-acting beta agonists (LABA), as well as different combinations of them, while delivering a predetermined ratio of APIs collocated to the target site in the lung. Indeed, the opportunities of particles design and engineering technologies in the life sciences and biopharma industry is enormous. Although in appearance some new developments could seem to have limited success, alternative options are constantly emerging for services or novel tools for research. Moreover, excipient manufacturers could also play a preponderant role around this technology. For instance, therapies associated with the gastrointestinal tract (GIT), such as those indicating the use of cyclodextrins, can additionally serve as solubility enhancers, the same as inhalers could present similar characteristics in treating respiratory disorders. Nevertheless, the current trend of particles design embraces the solution of the problem at the design and engineering state, avoiding particles post-processing to reach their desired functionality. According to this, the goal is focused on advanced material sciences and engineering. Protein-coated microcrystals (PCMCs) have also proven to improve therapeutics through the particle engineering of biomolecules. The approach broadly consists of the formulation and stabilization of proteins, nucleic acids, and vaccines through the coprecipitation of water-soluble carriers, typically amino acids or carbohydrates, with dehydrated biological macromolecules. By these means, the product results are perfectly suitable for delivering biomolecules in different ways, principally pulmonary and parenteral. Boehringer Ingelheim has excelled in the development of this technology. Leveraging nanotechnology approaches, Hosokawa Micron Group, a leading supplier of the latest powder and particle technologies, and particularly, nanotechnology approaches, has rapidly advanced to encompass their strong expertise in traditional powder sciences with novel nanotech approaches. Hosokawa, which possesses an unmatched position in the marketplace, has launched an aggressive R&D program to penetrate other industries and participate in joint projects with public organizations and joint agreements with other companies. Along the same line, Q Chip, a Cardiffbased biotechnology company strongly focused on drug delivery, especially through the development of long-acting injectable therapeutics, has developed its Q Chipâ€™s proprietary platform, Q-Sphera, a breakthrough microsphere manufacturing and formulation system that is compatible with small molecules, peptides, and proteins. Q Chip development offers unique functionalized microparticle delivery systems, aiming to meet the requirements for sophisticated life science applications, products and services. Among the main goals, the company faces the development of new delivery methods for therapeutics with controlling release, thus substantially improving drug formulations. In the opinion of the researchers, such multidisciplinary and multi-targeting approaches also come along with the encompassed development of new equipment and medical devices. As part of its services programs, the company also offers an important portfolio of new functionalized bead-based assays. FIGURE 3. 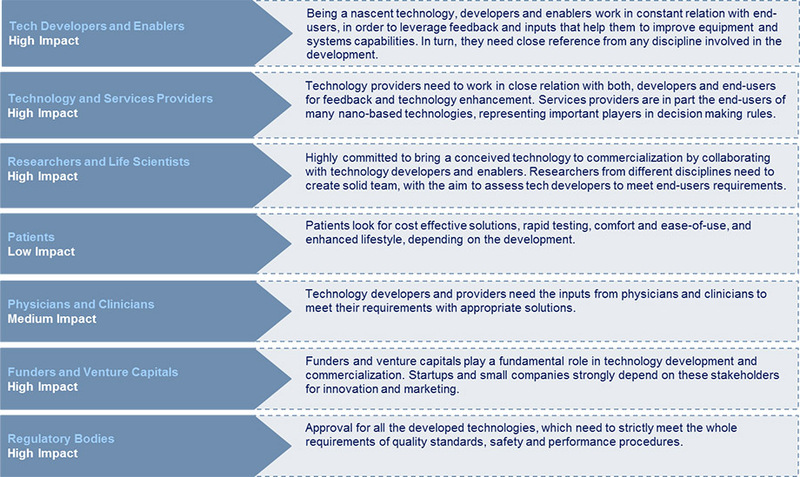 The size of the innovation ecosystem around particle design and engineering. Source: Frost & Sullivan. Another remarkable case regarding technology providers is constituted by Liquidia Technologies, started as a University of North Carolina – Chapel Hill (UNC) company, which has established a powerful and versatile nanotechnology-based product development platform – PRINT. Such a nanotech platform has significantly contributed to revolutionizing the concept of engineered therapeutics. Liquidia has leveraged its approach to fabrication techniques from the semiconductor industry to effectively design and engineer novel particles in a broad spectrum of sizes, shapes, and compositions. According to the researchers, novel developments in particle design and engineering extrapolate the frontiers for new product developments, which is remarkable. The PRINT platform enables Liquidia to address the creation of precisely engineered vaccines, therapeutics, and other health-related products. Associated with SCF technology, SEPAREX, a French high-tech suppler, which provides its customers with high-pressure components, standard and tailor-made systems for R&D, has penetrated the market with its recently designed and built equipment for SCF technology. 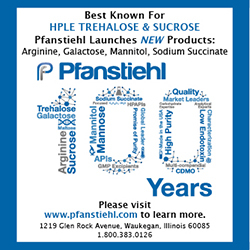 The company has addressed the challenge of scalability, performing work at different scale levels, from lab-scale for screening new chemical entities or biomolecules available in very limited amounts, as well as pilot-scale equipment and semi-industrial plants for manufacturing clinical lots operating under cGMP rules. Similarly, different pilot-plants for inorganic powder formation capable of operating either with supercritical carbon dioxide (and cosolvents) or supercritical water have been developed. Finally, in reference to virus-like particles (VLPs) and engineered antibodies (EAs), the synergy among self-assembly technologies and protein engineering advancements has been very fruitful. VLPs demonstrate significant potential in eliciting stronger and more efficient immune responses in comparison with conventional recombinant protein vaccines. In general words, VLPs mimic the external protein structure of a virus, avoiding the inclusion of the genetic material, and thus inhibiting viral replication. For that reason, VLP vaccines are not able to cause any infection by themselves. Rather, VLPs present viral antigens in the most authentic configuration possible, so that the human immune system responds to a VLP vaccines in the same manner as if the virus is present, without the danger of infection, and also can build its immune defenses. LigoCyte, a private, clinical-stage biopharmaceutical company focused on developing novel vaccines for gastrointestinal and respiratory indications, has focused its expertise in VLPs technology, supporting a pipeline of enhanced product candidates, including vaccines against norovirus, influenza, respiratory syncytial virus, and rotavirus. The company, recently acquired by Takeda Pharmaceuticals, has developed an important portfolio of core technologies to efficiently produce a broad spectrum of VLPs vaccines. Other instances of VLPs vaccines include the recently licensed vaccines against human papillomavirus (HPV), Merckâ€™s Gardasil and GSKâ€™s Cervarix. Particle engineering approaches in biomolecules are addressed through EAs. This is the case of Ablynx NV and its nanobodies. Nanobodies are antibody-derived therapeutic proteins consisting of the unique structural and functional properties of naturally occurring heavy-chain antibodies. The seed idea derived from the discovery of fully functional antibodies that lack light chains, such as in the case of camelidae (camels and llamas). Later, a single variable domain (VHH) and two constant domains (CH2 and CH3) were identified in the heavy-chains antibodies, conferring their unique structural and functional properties to form the basis of a new generation of therapeutic antibodies. One of the most amazing phenomena observed along the implantation of this technology relies on the technology condensation/expansion capability. As a physics phenomenon, particle design and engineering approaches were defined several decades ago. However, as a discipline of science and engineering, leveraged to serve as new innovative tools and products in the life sciences and biopharmaceutical arenas, the technology is relatively nascent. In this regard, advance manufacturing techniques allowing building structures with the desired properties, practically selected according to the specific behavior of a device and its application, or therapeutic response, have begun to play a highly dynamic role. Beyond the structure, micro/nano-particle systems and devices constitute powerful tools, applicable not only to study fundamental life sciences, but also for practical biochemical and clinical applications. The convergence of a plethora of technologies suggests the creation of new technology clusters that leverage the synergy among several disciplines. Predictions for 2020 include claims of a total restructuration of both tech and business clusters and niches favoring innovation and technology translation from R&D institutions to industry sectors. This convergence can be strongly evidenced in terms of products, as referenced in the earlier paragraphs. A direct correlation with business development activities is exhibited by evaluating the evolution and dynamics of business models in time, taking as a reference research, development and tech transfer tasks. 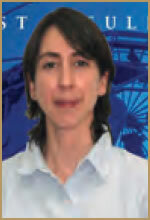 Cecilia Van Cauwenberghe is a Senior Research Analyst with Frost & Sullivan’s Technical Insights practice. She has more than a decade of professional expertise in chemical and biomedical engineering arenas, including life sciences, biotechnology, healthcare, and biomedical devices, as well as biomedical and clinical engineering. Her particular expertise in leading and executing projects relate to biopharmaceutical and biochemical modeling, simulation, and optimization; microelectronic implantable devices design; and studies in metabolic syndrome and cardiovascular diseases applications. Her expertise and professional development has grown through work with academic and healthcare institutions as well as leading firms, including the Dr. Rene G. Favaloro Foundation University, South National University, Comahue National University, YPF SA, Techint Group, and the National Institute of Industrial Technology. She has performed Doctoral Studies in Chemical Engineering, Master of Science in Biochemical Sciences, as well as a Bachelor of Science in Chemical Engineering and Mathematics.